Minis and Range Rovers parked dockside at the Port of Southampton, U.K., in Oct. 2015. The United States currently imposes a 2.5 percent tariff on imported passenger cars from the European Union and a 25 percent tariff on imported pickup trucks. The EU imposes a 10 percent tariff on imported U.S. cars. WASHINGTON -- President Donald Trump threatened to impose a 20 percent tariff on all European Union-assembled light vehicles coming into the United States, a month after the administration launched an investigation into whether auto imports pose a national security threat. How such a threat would be executed without violating World Trade Organization rules is unclear and it comes after the administration has already opened an investigation into whether to impose a 25 percent global tariff on all imports of autos and auto parts on the premise that they pose a national security threat. The U.S. Commerce Department aims to wrap up its investigation into whether imports of automobiles and auto parts pose a risk to national security by late July or August, Commerce Secretary Wilbur Ross said Thursday. The Commerce Department plans to hold two days of public comments in July on its probe of auto imports. The European Autos Stocks Index fell sharply after Trump’s 20 percent tariff tweet and was last down 1.25 percent. Shares in General Motors and Fiat Chrysler Automobiles rose slightly while Ford was down 3 cents as of 1:39 pm ET. Trump has repeatedly singled out German auto imports to the United States for criticism and reportedly told French President Emmanuel Macron he wanted to halt Mercedes-Benz models from driving down Fifth Avenue in New York City. He told automakers at a White House meeting in May that he was planning tariffs on some imported vehicles. Trump also has threatened duties on up to $450 billion of imports from China. Administration officials have said China should strengthen protections for U.S. companies' intellectual property, and reduce tariffs on U.S. products. Trump’s trade policies have also escalated conflict with Canada and Mexico as he seeks to renegotiate the $1.1 trillion North American Free Trade Agreement on terms more favorable to Washington. German automakers did not comment on Trump's tweet. 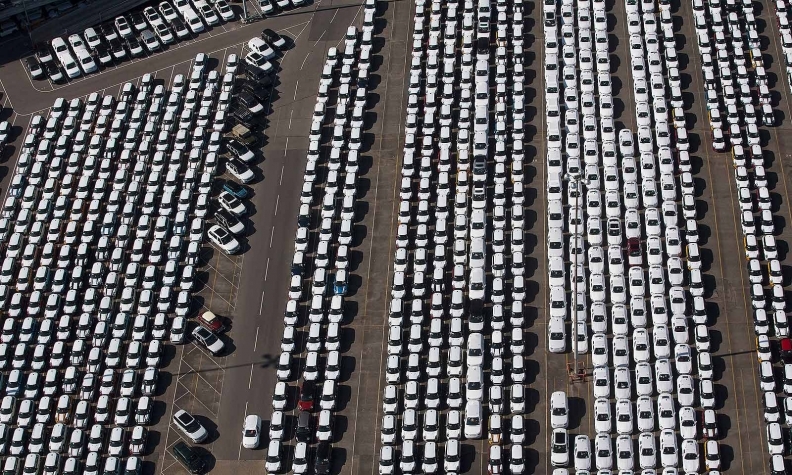 German auto industry association VDA said Germany exported 657,000 cars to North America, 7 percent less than a year earlier, and 200,000 fewer cars than in 2013. The German automakers produced 804,000 vehicles in the United States last year. Automotive News data shows about 7.2 percent of vehicles sold in the United States through May were assembled in Europe. The risk of a trade war is becoming more real, said Jeff Schuster, senior vice president of forecasting at LMC Automotive, before Trump’s latest salvo. BMW and Daimler have had a quarter-century presence in the U.S. BMW started making cars in Spartanburg, S.C., in 1994. Its biggest plant globally, where it only makes crossovers, has made it the largest U.S. car exporter by value, shipping vehicles worth some $10 billion last year. Daimler makes vehicles like the GLE SUV and C-Class sedans at its factory in Tuscaloosa, Ala. The company last year said it would invest $1 billion to start making electric vehicles there. The plant sends enough cars to China that Daimler blamed a profit warning this week on China’s plan for retaliatory tariffs against the U.S.
Volkswagen makes models including Passat sedans and Atlas SUVs in Chattanooga, Tenn., for the U.S. market while Volvo Cars could export cars to China from its plant that opened this week near Charleston, S.C.
Arndt Ellinghorst, a London-based analyst at Evercore ISI, estimates the German manufacturers would suffer a financial hit of about 4.5 billion euros ($5.24 billion) if Trump follows through on his threat. A 20 percent tariff “would be a TERRIBLE (to use modern language) scenario for Germany,” Ellinghorst said in a note to clients. “Not a single car could be shipped with a profit to the U.S.,” he said. While the damage would be steep, Friday’s proposal is actually lower than the 25 percent previously floated by Trump. A surcharge at the higher rate would add around 10,000 euros ($11,659) to the sticker price of a European built car, the European Commission said in a report obtained by Bloomberg News prepared ahead of next week’s summit assessing tariff threats. Duties at this level could be expected roughly to reduce U.S. imports of car and car parts in half. German car-lobby group VDA called for continued talks with the U.S., saying any further escalation of trade conflict “is of no use to anyone.” For its part, the EU is worried that U.S. tariffs would cause “severe disruption” to the bloc’s auto industry, according to the paper. Bloomberg and Automotive News contributed to this report.